Elizabeth Olsen & Olivia Wilde posed on the red carpet for the premiere of 'Kodachrome' at The Arclight Hollywood theatre in LA yesterday evening(April 18th). Elizabeth Olsen kept it simple in a white CHRISTIAN DIOR two-piece suit and black sandals. To give her look an edgy touch, a bold red lip was added to her beauty look. Off-the-shoulder tresses and a gold ring finished up her look. 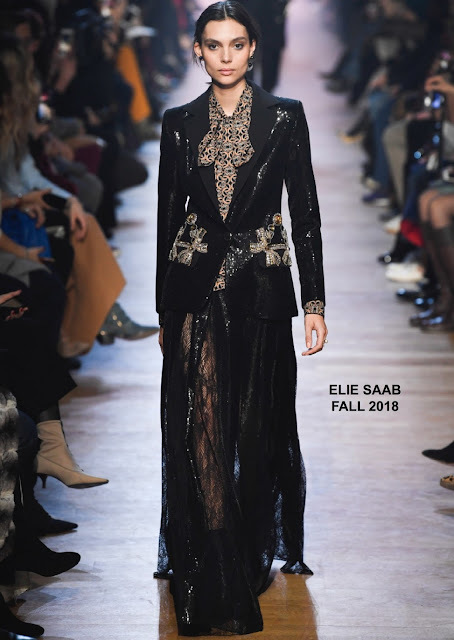 Olivia Wilde went the sparkly route wearing a ELIE SAAB FALL 2018 black sequined blazer with contrasting lapels and Swarovski beaded bows at pockets and a black sequined maxi skirt with lace panels. Instead of going braless, the actress opted to wear a black bra under her blazer. Accessorized with SARA WEINSTOCK earrings, she finished up with smoke eyes and a center part medium cut.